Fallout Anthology is a collectors edition game bundle for Fallout that includes 5 different Fallout games plus a mini nuke collectible case for your games! This is for the PC / Windows only. This is a great collector edition set for any Fallout fan. While this collector set does not include Fallout 4, there is a Fallout 4 disc jewel (cardboard case) included so that if you buy or already own Fallout 4 on disc you can complete your Fallout collection! I personally purchased Fallout 4 on disc just so I could own the complete collection, which some people may not care about but personally it bugged me so I bought it. I know own Fallout 4 on the PC twice, Xbox One and the PS4. Other notable features for this collectors set, the mini nuke included does have the “mini nuke” sound that you find in Fallout games complete with the cha-ching sound at completion of the explosion, just like in the game. 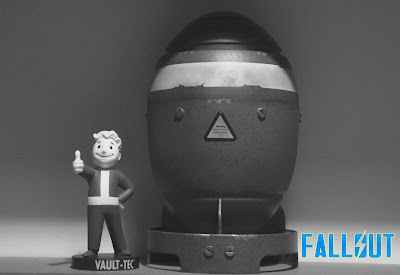 The mini nuke itself is made of plastic, it is not heavy at all, if I had to guess I’d say 2 pounds maximum. The paint job is great, it looks tarnished and matches how the mini nukes looks in-game. I paid $49.99 for the Fallout Anthology collection which is a solid deal for 5 games plus a collectible. If you look on Steam you would pay $60 for the same 5 games and that would not include the mini nuke collectible. 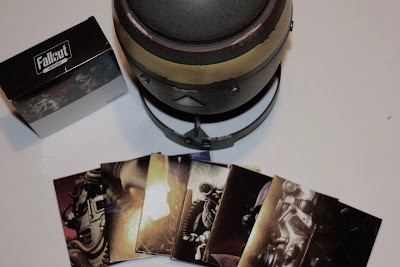 So not only is it cheaper to buy the Fallout Anthology collector set, you also get the mini nuke making it a much better buy for anyone interested in owning the complete collection! Need a Season Pass for Fallout 4?